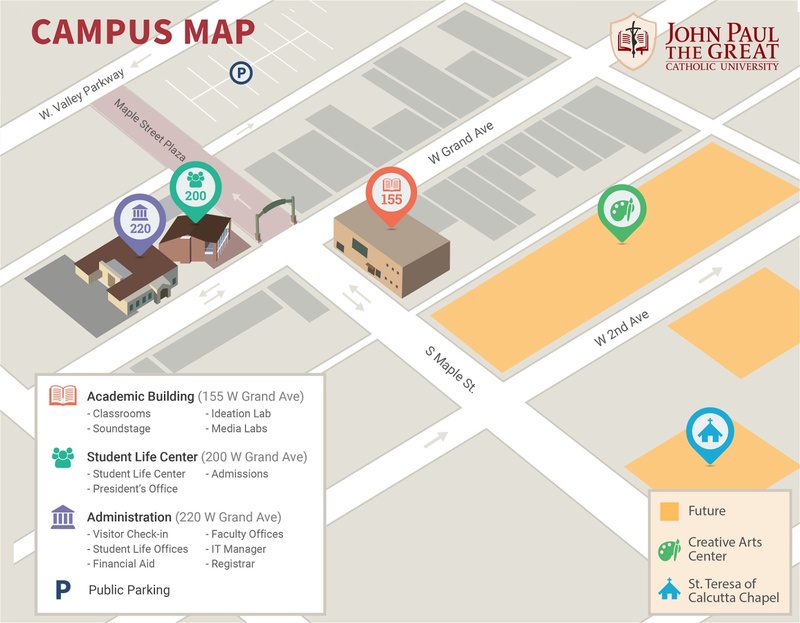 John Paul the Great Catholic University is a visionary teaching institution focused on and dedicated to forming students into future innovators and creators, leaders and entrepreneurs. Students have the opportunity to acquire a deep and personal knowledge of Jesus Christ. Catholic ethical, moral, and social values provide a guiding compass for everything we do. 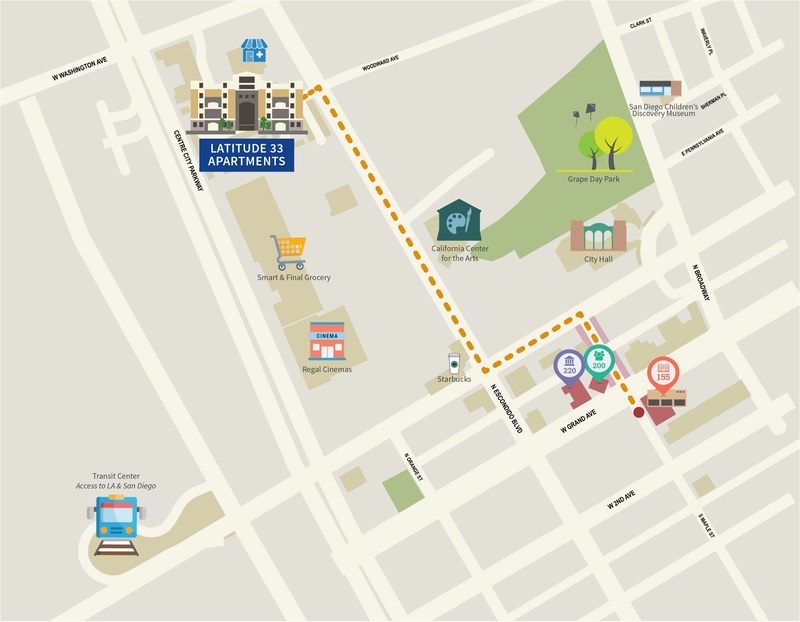 The Founders are driven by the vision of creating a world-class university for students seeking degree programs in communications media, business, and theology. JPCatholic is committed to the success of all our students. This includes setting and assessing learning outcomes for the institution and each program, as well as monitoring retention and graduation rates for all students. This website provides an overview of the processes and data used to monitor and improve student success, with links to further data where available. Our Program Learning Outcomes (PLOs) align with the university mission to impact our culture for Christ and the Institutional Learning Outcomes. The Program Learning Outcomes guide faculty and students in each degree program towards achieving the mission of JPCatholic in their specific focus area. Faculty develop course learning outcomes for each course that align with the Program Learning Outcomes. Students are asked to assess their mastery of the course learning outcomes through the course evaluation system. Evidence of achievement of the course and program learning outcomes is collected in every course through the use of signature assignments. The signature assignment for a particular course is designed to measure student learning for one or more of the Program Learning Outcomes associated with the course. Examples of signature assignments include research papers, presentations, tests, film projects, and business plans. Student scores on the signature assignments are collected and reviewed to determine how well students are achieving the Program Learning Outcomes. This data is analyzed by faculty as part of the program review process. 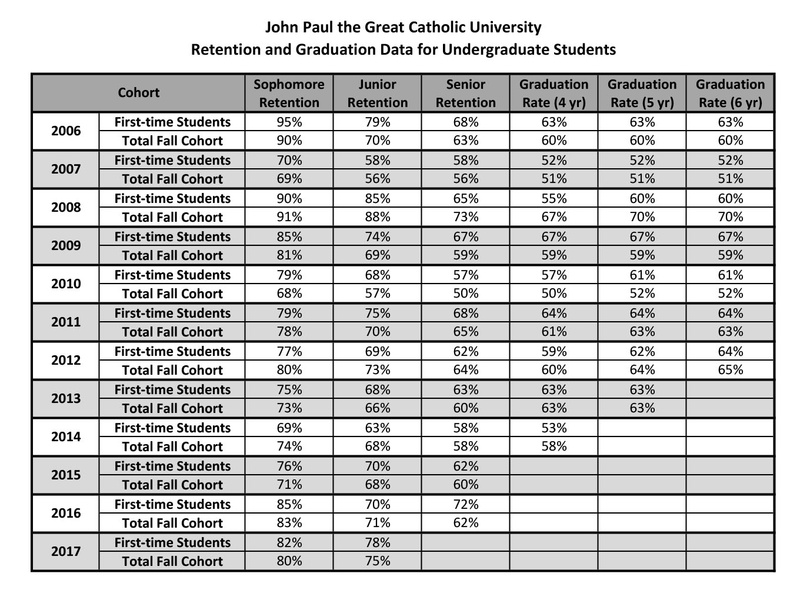 JPCatholic collects data on student persistence and graduation in all programs. The most recent available data is shown below. Data on retention and graduation are also reported to the National Center for Education Statistics (NCES) through the Integrated Postsecondary Education Data System (IPEDS).